The book, who I am, why I wrote it. Like me, you’re probably old enough to have lived through a few really difficult times when it was hard to stay positive. In my case, I was longing to feel connected to myself (including my body) and to others, to feel at peace, and to be able to touch grace. There are too many options to wade through, and very little clarity about what is important and how to get started with a simple, effective practice that can take us from suffering, to peace. This is the original reason I wrote this e-book, which eventually became the basis of my Core Transformation Program. 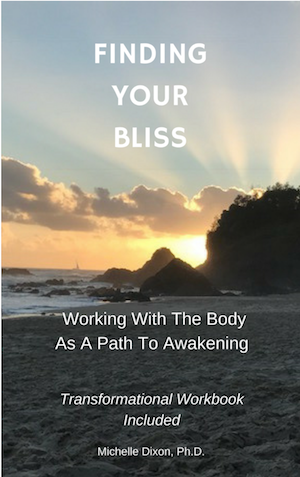 In this book, I talk about how the body holds emotion and memory, and how you can release it. On the basis of all the research that led me to create this book, I created my Core Transformation Program. By doing certain practices, in a certain way, NOT ONLY did I help myself and others recover from stress and trauma … I was also able to move myself, and my clients, into expanded states of consciousness. Peace. Bliss. Awakening (however you conceive of it). My approach draws on several modalities. I’m trained in hypnotherapy, NLP, energy healing, intuitive readings, biodynamic cranial touch, de-armouring, and life coaching. I am also a top-rated Udemy instructor and a workshop facilitator. HOWEVER, my biggest accomplishment (other than my children) is taking the complexity of neuroscience, psychology, contemplative traditions, and somatic approaches to stress and trauma – and creating a simple and effective program consisting of 6 core practices. If you want, you can also check out my Core Transformation Program and find out how to work with me by watching my video training on my 6 Core Processes HERE.